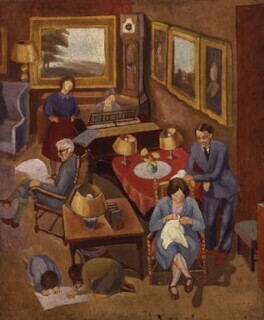 Peggy Angus, artist and educator, was born in Chile but spent most of her childhood in London. At the age of seventeen, she won a scholarship to the Royal College of Art in London. First and foremost a painter, she became best known for her crafts, designing tiles and creating hand-printed wallpaper from carved linoleum blocks. She taught art for many years at the North London Collegiate School for Girls.